This is the introduction to an article I wrote some months ago for the world-wide known Popular Mechanics, the official website of the famous classic magazine of popular science and technology (the first issue was published on January 11, 1902!). The article titled "All the Nuclear Missile Submarines in the World in One Chart" looks at today's world's ballistic missile submarines, their numbers and capabilities. A ballistic missile submarine is a submarine capable of deploying submarine-launched ballistic missiles (SLBMs) with nuclear warheads. Officially only seven countries in the entire world deploy nuclear weapons at sea, an exclusive and deadly club. 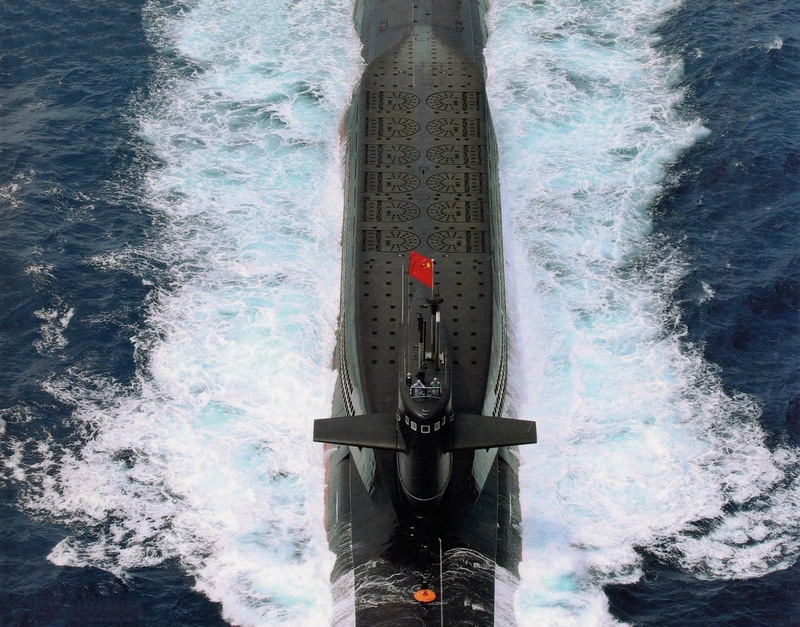 The ballistic missile submarine, either nuclear-powered (SSBN) or diesel-electric (SSB), is the most reliable means of nuclear deterrence. These vessels would survive a first strike and retaliate, which is meant to prevent an enemy from ever using its weapons. These fearful underwater giants stay hidden in the oceans avoiding detection at all costs and are always ready for the moment they might be needed. Enjoy my take on these marvelous beasts here! 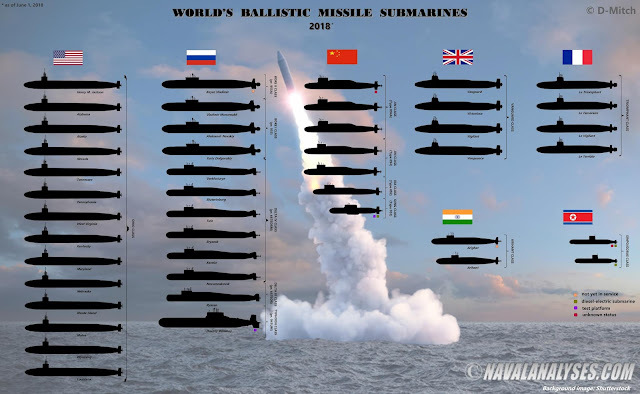 World's Ballistic Missile Submarines. For high resolution image click here. 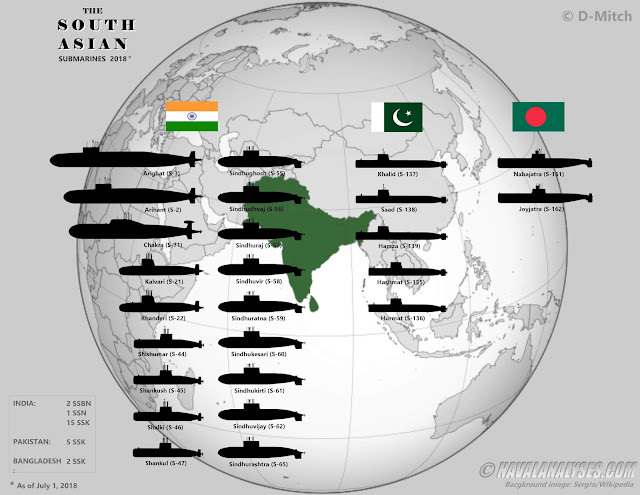 In the following infographics, I depict all the submarines that are in active service in Asia as of July 1st 2018, by subregion. I do this in order anyone could easily compare the forces of neighboring countries. The submarine forces of Western Asian, West Asian, Southwestern Asian or Southwest Asian countries (Iran, Turkey, Egypt, Israel) are excluded, as their forces are included already in other graphs such as The attack submarines of the Mediterranean in 2018 or The attack submarines of Asia and Australia in 2018 (China and Russia excluded). 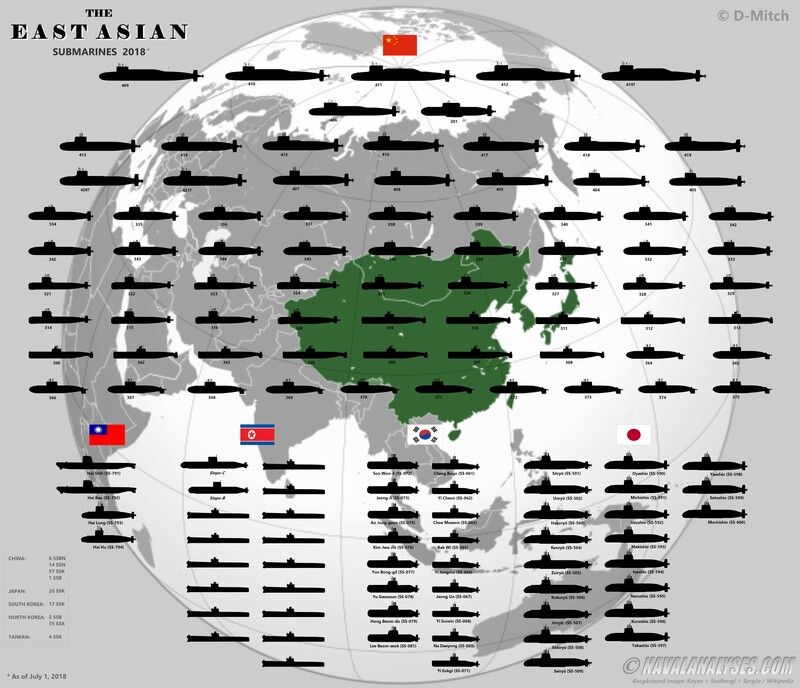 The North Asian submarine forces (only Russia belongs to that subregion of Asia) are excluded as well while the Central Asian countries have not submarines in their inventories. In all graphs mini-submarines and small coastal submarines are not included. Notice that in Southeast Asia, Thailand will join the rest of the submarine forces with three submarines in its inventory. There are 136 submarines in total in East Asia, 25 in South Asia and 17 in Southeast Asia. The East Asian submarines in 2018. For a high resolution image click here. The South Asian submarines in 2018. For a high resolution image click here. 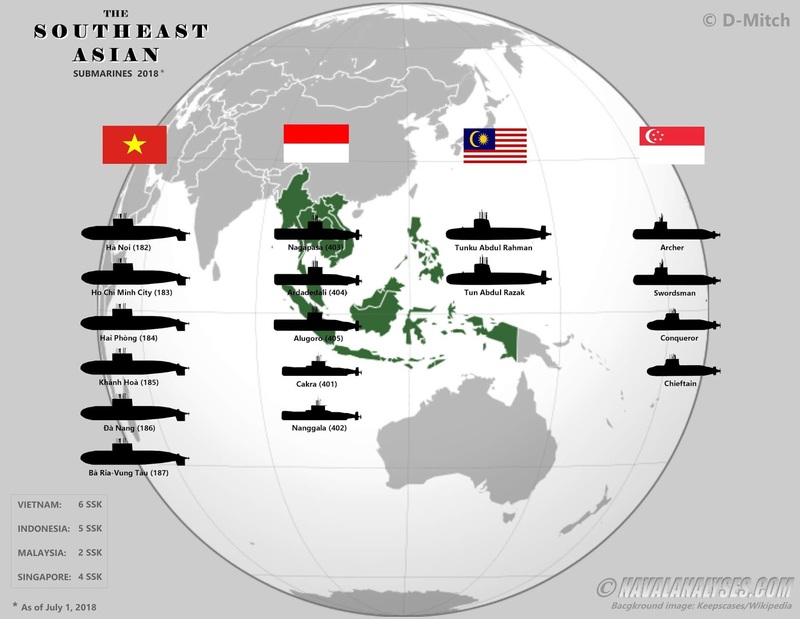 The Southeast Asian submarines in 2018. For a high resolution image click here. In the following infographic, named The Americas Submarines, I depict all the submarines that are in active service in America as of July 1st 2018. Currently, the United States Navy operates a massive amount of powerful nuclear-powered submarines, consisting of 14 Ohio class ballistic missile submarines (SSBN), four (4) Ohio class (modified) guided missile submarines (SSGN), three (3) Seawolf class nuclear-powered attack submarines (SSN) (including the highly modified USS Jimmy Carter SSN-23), 16 Virginia class SSN, 22 Improved Los Angeles class SSN, and 10 Los Angeles class SSN (see The United States Navy submarines in 2018). Three more Los Angeles boats are on paper still in commission but actually are out of service. San Francisco is being converted to Moored Training Ship (MTS), Jacksonville, has started a months-long preparation for inactivation and decommissioning and Buffalo is under inactivation and decommissioning procedure. 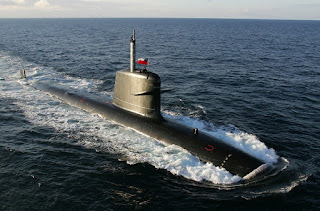 Regarding the rest of the countries in the continent, there is no nuclear-powered submarine (SSN) in any Navy (at least until Brazil commissions its first vessel after 2020), neither there is a submarine equipped with Air-Independent Propulsion (AIP) system (the Chilean Scoprene class submarines are fitted but not with the system and will receive it in a future refit). 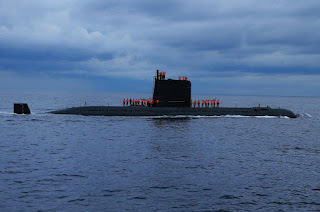 It should be mentioned also that from the 21 countries of Latin America, only seven navies (7) have submarines in their fleet; Peru has the most numerous fleet but Brazil and Chile the most modern submarine fleets in the region. Moreover, the 92% of the Latin American submarines are German-built (!). Also, Argentina, while it has in its inventory the largest submarine in the region (TR1700 class: 67 meters length and 2,100t displacement), none of its submarines is currently in active service (see more details at The Attack Submarines of Latin America in 2018). 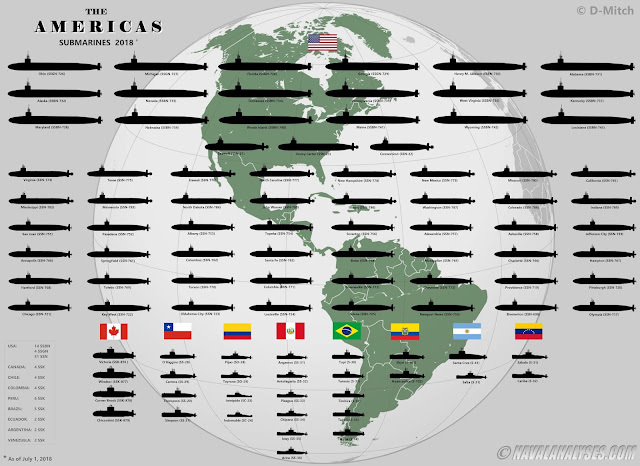 In the Americas, there are 98 submarines in total of which the 69 are of the U.S.Navy. The Americas submarines in 2018. For a high resolution image click here.